May | 2011 | Wait... What? I’m thrilled to write that we have 4 masters level students (or recent grads) who have been prepping for the past few months for 8-10 weeks of ICT4D, child participation, and child protection work with our teams at Plan Benin and Plan Cameroon. My last post here on Wait… What? was an excellent guest post by Paul Goodman (@pdgoodman) who has been working with Plan Benin for most of May to help optimize the Frontline SMS / Ushahidi-based violence against children (VAC) reporting system that we initiated a little over a year ago. Paul is a Masters Level student at the School of Information Management and Systems at the University of California, Berkeley. In addition to on-the-ground ICT4D experience in Haiti, Pakistan and Bangladesh with DAI, he has worked on several USAID funded projects including the Cuba Development project and the Global Development Commons. 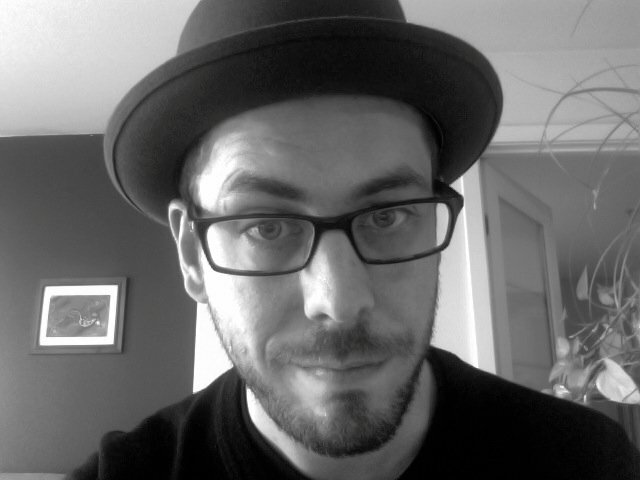 Paul has also worked in business development and as a press assistant, multi-media editor and freelance photographer. 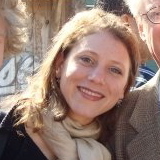 Jacqueline Deelstra has just completed her Masters at the Fletcher School at Tufts University. 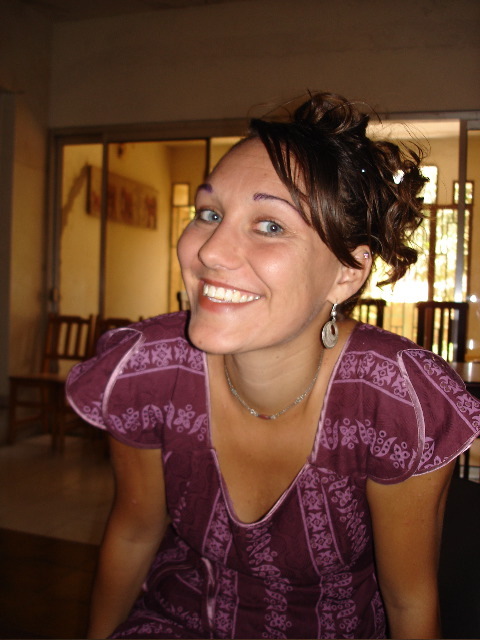 She’s worked overseas in the past with Twaweza in Tanzania and Kenya, World Teach in Ecuador and Tostan in Senegal. While at Twaweza, she focused on citizen reporting, village mobile phone surveys, and the use of mobile phones in development and governance programs. Jacqui will be spending her time in Atacora and Couffo, Benin, learning more about the social context and social challenges surrounding the implementation of the above-mentioned Violence against Children Reporting system in Benin, and looking at its contribution to good governance. In Cameroon, we will be working with Joe Pavey and Rebecca Tapscott. Joe (@joepavey) is a Master of Communications student in the Digital Media program at the University of Washington, where the program has an emphasis on storytelling and technology. Joe also spent 7 years at Microsoft, where he specialized on new standards of practice for processing and encoding video content. 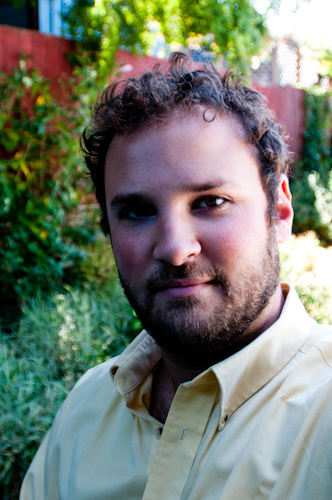 His undergraduate degree is in documentary film production. Joe will support the Youth Empowerment through Arts and Media (YETAM) Project on the technical side, helping youth and local partners in Cameroon to improve video production quality and to streamline the process from editing to uploading. He’ll also work closely with the well-skilled Cameroonian ICT team that is setting up a violence reporting system using Frontline SMS and CrowdMap, based on our learnings from the system in Benin. Rebecca is a first-year Masters degree student at the Fletcher School at Tufts University, with experience in both development and journalism. She has also worked as an assistant researcher on a story about the Daniel Pearl case, a legal assistant and a production assistant at NPR. She previously completed a 6-month internship with Tostan in Senegal, where she worked closely with staff and program participants to support program implementation and evaluation. She also wrote stories for the Tostan website and blog. Rebecca will support the local partners and youth who participate in the YETAM project, especially with uploading content to the web and growing more accustomed to social media and ICTs in development. She will also be doing research on the traditional practice of breast ironing as an independent side project. Joe and Rebecca will spend 8-10 weeks in Cameroon with the Plan team. I’m super excited to have Paul, Rebecca, Jacqui and Joe on board, as are the teams in Benin and Cameroon. Look for some posts from the team on the Plan USA Blog and relevant cross posts here at Wait… What! This is a guest post by Paul Goodman, who is spending the month of May supporting Plan Benin’s Violence against Children (VAC) prevention and response project. The post appears on Paul’s own blog and also on Plan USA’s blog. I’m working with Plan Benin to support the Violence Against Children project. The team here has established a system whereby victims of violence and observers of violence can send text messages to Plan to report violence in their communities. Plan then processes and maps the messages and works with the government of Benin to investigate the cases. In about a year of operation the system has received more than 80 reports of violence against children. The reports include physical violence, sexual violence, psychological violence, and other abuses including kidnapping, negligence, and so on. At the beginning of the year the team identified a number of technical challenges that they’re facing using the system, which rests on the foundation of two stellar open source technologies FrontlineSMS and Ushahidi. Those technologies are the focus of my time here in Benin though along with everything else in life, nothing is black and white. “Technical” issues are often social, social issues often have no technical remedies, and things become confused. Beyond the division of technical and social, there are many other factors to consider. Thorough problem definition and planning for the short, mid, and long term are necessary to help define expectations, support project evaluation, and improve the chances of sustainability. These themes should be revisited periodically and updated as necessary. In recent months Plan Benin lost two staff that were key to the day-to-day management of the system. Their departure temporarily disrupted the flow of information through the system but also created an opportunity: with a renewed organizational focus on the system we have an excellent opportunity to revisit the purpose of the initiative, consider the day-to-day functionality of the system, and ask (and hopefully answer) questions about the initiative’s future. 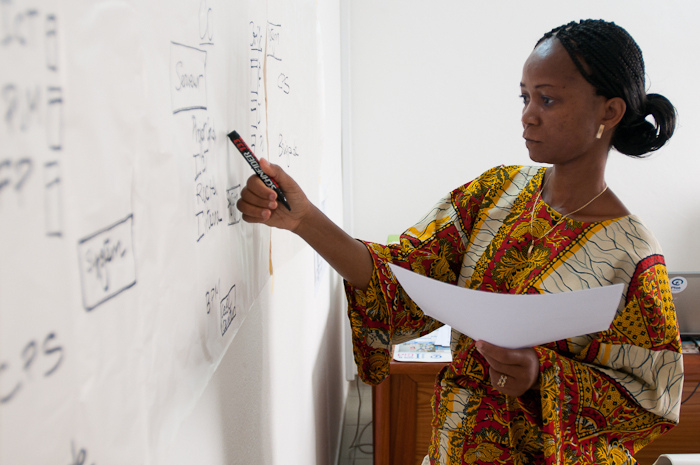 Today I worked with Elsie S., Plan Benin’s Project Coordinator, to chart out the operation of the system. The purpose of the exercise was to clarify the day-to-day operation of the system and revisit the roles and responsibilities of the many actors that interact with this project. 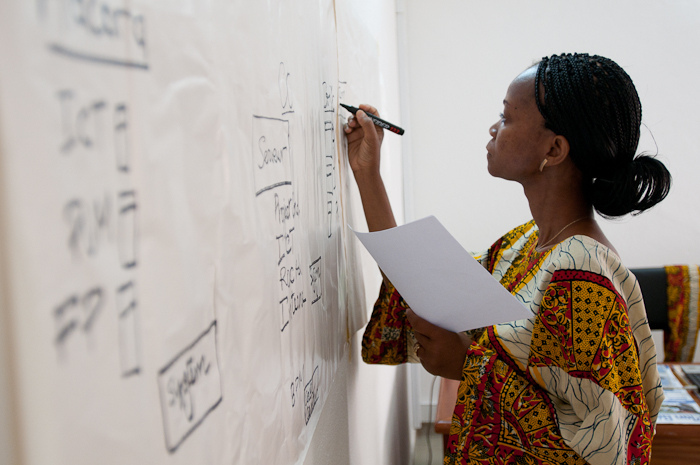 Getting a firm grip on all of this information and documenting it for others will make it easier to train staff and partners and build further support inside Plan and within the government of Benin. — How long should it take for incoming messages to be processed (stripped of personally identifying information, mapped, and so on)? — What model is best for managing this process? Should the responsibility be centralized at the Plan Benin Country Office? Or should it be distributed to the Plan Benin Program Units (PUs) where the majority of the reports originate? — How can we modify Ushahidi to support a distributed model, where focal points in the PUs take responsibility and have agency? 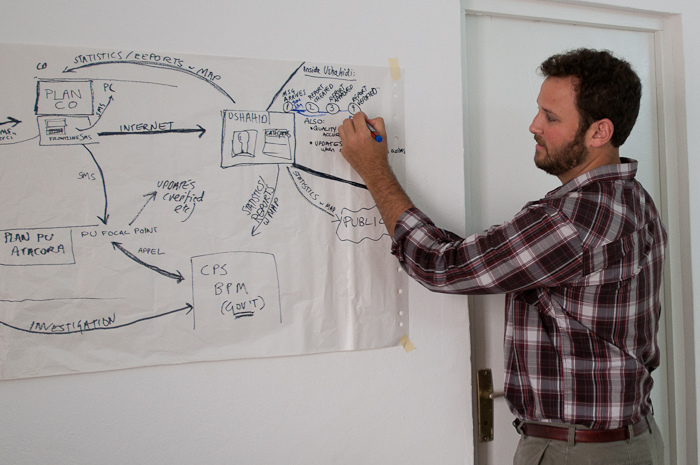 — How can we create a shared vocabulary around the various actions within the Ushahidi system? What does “approve” mean? What does “verify” mean? Me describing my version of the workflow and discussing realistic timelines for different actions within Ushahidi. In the coming weeks we’ll work with Plan Benin staff to ground truth any revisions to the workflow and modify the system as necessary. We’ll also spend quite a bit of time creating the documentation that will ensure the continuity of operations in the future: reference guides for Plan staff, guidelines for maintaining the privacy of victims, and documentation of the relevant technical aspects of the system. In parallel, I’ll continue working on some necessary tweaks to Ushahidi including establishing security protocols, enhancing the system’s mapping capabilities (thanks John Etherton for your location highlight plugin and support), and more. In ten days we’ll be joined by Jacqueline Deelstra, a recent graduate of the Fletcher School at Tufts, who will continue these activities and dig deeper on the relevant social issues. Note: For background and additional posts on child protection, child participation and the VAC Benin project, click here. Estaba hablando con una amiga en el Facebook. Me había contactado porque estaba interesada en participar en el curso sobre las TICs (Tecnologías para la Información y la Comunicación) que había mencionado en mi último post. Su primera pregunta fue – Y los cursos, los ofrecen solamente en Inglés? Por ahora, sí, le dije. Pero TechChange está iniciando con los cursos ahorita. Es posible que a futuro ofrezcan cursos en otros idiomas. OK, dijo mi amiga. Genial. Vamos a esperar esto…. Bueno. Mi amiga habla el suficiente ingles para sacar mucho provecho de estos cursos, pero para poder asistir al curso, hay otros factores que le parecían hasta más difíciles a superar. Y lo triste es que estos factores son internos. Ahora, ¿sabes el problema? decía mi amiga, Acá vemos que el costo es de 250 o 300 dólares. Ah, pensaba yo. El costo es muy alto. No, decía ella. No es el costo. Es que acá en [su organización] los pagos online están prohibidos. Se consideran una POSIBILIDAD EXTREMA DE FRAUDE. Ella se reía. Jajajajajaja. Yo imaginé que su risa era de frustración y un poco de amargura. Pues, mi amiga tiene presupuesto y mucho interés en participar en la capacitación, pero no puede inscribirse porque en su organización, no está permitido hacer pagos online. Wau, le respondí. ¿Ayuda si yo mando un correo o algo? No, me dijo ella. Es la política de la organización. No se pueden hacer pagos online, aunque sea mucho más barato y sea lo específico que necesites y no esté disponible en tu país. Bueno y si usas tu propia tarjeta de crédito y pedís que te reembolsen? le pregunté. Ay no, dijo mi amiga. Nadie nos apoya con esto, especialmente con este tipo de cosas que no conocen y no entienden. Necesitamos este tipo de cursos para el personal nuevo y joven que tiene mucho interés en estas herramientas. Pero es difícil hacer que la gerencia entienda. De allí mi amiga escribió en letra mayúscula: LINDAAAAAAA TIENES QUE VER COMO PODRIAS APOYARNOS CON ESTO DE LAS TICS! Somos pocos en la organización los que manejamos esto y no nos creen de su efectividad. Ella continuó. Estamos empezando con esto. Tenemos lo básico y tenemos fondos para capacitarnos, pero nadie ve que es una prioridad. Ay, es muy complejo. Seguíamos hablando. Ella decía o, jaja, y por favor escribir tu blog en otra idioma para que podemos compartirlo. Es importante que nos actualicemos. Por lo menos nos permiten acceso a los blogs. Mira, agregó, No tenemos acceso a redes sociales. Tenemos un canal de YouTube que nadie puede ver en la oficina. Alguien hizo un Twitter pero todo el personal esta bloqueado del Twitter. Lo mismo con el Facebook. Ni los gerentes tienen acceso! Tenemos que ir a un Internet café o verlo en la casa. Yo entiendo que hay riesgos con los pagos online, entiendo que hay personas que podrían abusar de las redes sociales si no tienen restricción en las oficinas, y entiendo que en algunos países hay dificultades con el ancho de banda, pero esta plática me puso triste. La organización donde trabaja mi amiga es de un tamaño regular, e imagino que ésta es la política en toda la organización. Me pregunto si la organización ha considerado que sus políticas están afectando su habilidad de avanzar en su propia causa y su propio trabajo. I was chatting with a friend of mine yesterday evening on Facebook. She contacted me because she was very interested in participating in the TechChange courses that I wrote about in my last blog post. Now, my friend speaks enough English that she could get something out of these courses, but there are other factors that seemed to her even more difficult to surmount. And the sad thing is that these other factors are internal factors. ‘No,’ she said, ‘the cost is fine. But here [at our organization] we are not allowed to purchase anything online. Purchasing on-line is considered EXTREME POSSIBILITY FOR FRAUD.’ Then she laughed ‘jajajaja.’ I imagine it was a bitter and frustrated laugh. So here my friend has a budget and great interest in being trained, but can’t sign up because at her organization, they are not allowed to make on-line purchases. ‘I will try…’ I said. I understand that there are risks to purchasing on-line, and I understand that some staff might abuse social media if they are free to use at work, and I understand that there are bandwidth issues in some countries, but this conversation made me very sad. My friend works at a decent-sized organization and I assume this must be the policy across the organization. I wonder if the organization has considered that its policies are cutting into its own ability to advance its own cause and its own development work in today’s world. Ver este post en español! Almost a year ago, I met Ernst Suur (@ernstsuur) for the first time. We bonded in frustration over the irony of not being able to find any on-line courses to study ICT4D. We each did some research and didn’t come up with much, so we agreed I should write a blog post (See: Where’s the ICT4D distance learning?) to see if we could crowd source anything to help us out. We got some great comments with some good resources for the few courses that do exist or the ones that are in design. We also discovered TechChange, a newish organization looking to develop some on-line ICT4D courses. We all chatted a couple of times and decided to co-host a ICT4D chat on Twitter to see if we could come up with some additional ideas on what kinds of courses people were interested in. (See the chat summary here). I also had a chance to meet with Nick, Mark and Jordan in their DC office to discuss ideas. 1) Tech Tools and Skills for Emergency Management from September 5-23. Course topics include: Crisis mapping, human rights violations and elections monitoring, citizen journalism and crowd sourcing, and information overload and decision-making in real-time. ICT tools covered include: Ushahidi, Quantum GIS, FrontlineSMS, Open Street Map, Managing News. 2) Global Innovations for Digital Organizing: New Media Tactics for Democratic Change from September 26-October 4. Course topics include: the new media landscape, offline organization and change through online mobilization, data and metrics, censorship, privacy and security. 3) Mobiles for International Development: New Platforms for Health, Finance and Education from October 16-November4. Course topics include: mobile money systems, mHealth and mobile diagnostics, data management for monitoring and evaluation, many-to-many communications integrating mobiles and radio, and mobile learning. ICT tools covered include: mPesa, RapidSMS/Souktel, Sana Mobile, Medic Mobile, TxtEagle and FreedomFone. Register for any of the 3 courses here. 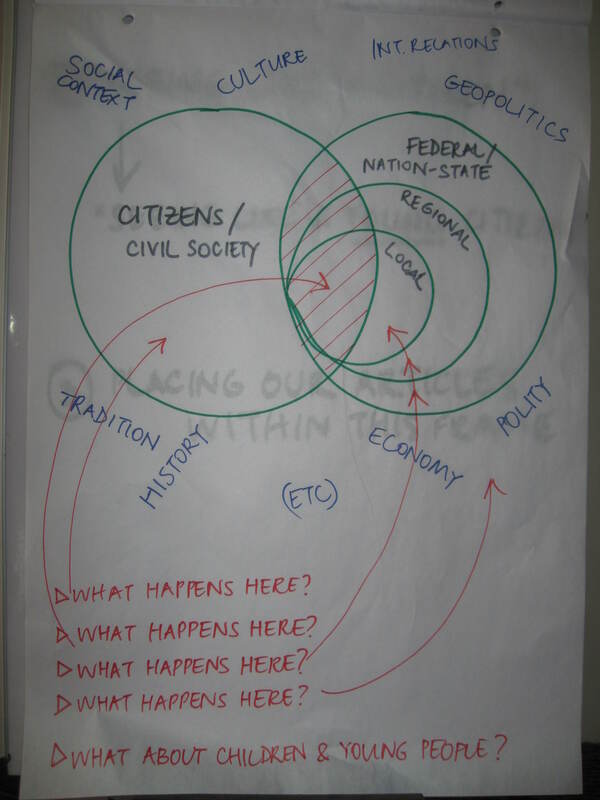 Where are the spaces for youth participatory governance? The ‘youth bulge‘ is impacting or will impact hugely in many countries in Africa, but there is limited documentation on youth involvement in social accountability processes in Sub-Saharan African countries. Youth and governance efforts have been ‘largely unsystematic and often constrained by the vague and paternalistic parameters of the UN Convention on the Rights of the Child (McGee, forthcoming 2010). However this is changing and there are calls for new models, tools and approaches that enable young people to take a more meaningful role in decision-making.’ (call for submissions for the upcoming Participatory Learning and Action Journal (PLA) special issue on Youth and Participatory Governance). In March I attended a “writeshop” put on by Plan UK, the Institute of Development Studies (IDS), and the International Institute for Environment and Development (IIED) to share different youth participatory governance initiatives, reflect on challenges and successes therein, learn how to write better, and finalize articles on the above topic for a PLA Special Issue in December 2011. The special issue will highlight some of the different ways young people are engaging with government to participate in public policy, planning and budgeting processes at local, national, regional, and international levels. Practitioners, youth and government officials from Kenya, Zimbabwe, Sierra Leone, Nigeria, Mali, Senegal, Lesotho, the US, the UK, Ghana, Germany and Liberia attended the writeshop. (The PLA will also have articles from Cameroon and Somalia). The first day we did a cool exercise revolving around 4 statements on voice, youth, participation, and governance. I learned a lot from the discussion and I wanted to share it here. So, what do you think? and why? Statement 1. The author’s voice will always be louder than the voices of the people he/she is writing about. Statement 2. Increased transparency leads to increased accountability. Statement 3. It is possible to do governance work without engaging in politics. Statement 4. Citizen led/social accountability processes offer more potential for youth than traditional accountability processes. Discussion: The group mostly concluded that it’s difficult for the author’s voice to stay in the background – it will inevitably jump out and become stronger than the voice of those he or she is writing about. Note: Some methods for involving youth in the writing process will be covered in the upcoming Special Issue, based on experiences from the group attending the writeshop. Discussion: Most everyone disagreed with this statement, saying that there is no causal relationship between transparency and accountability. Discussion: The group was pretty evenly divided between strongly agree, agree, disagree and strongly disagree, so the discussion was really interesting. Statement 4. Citizen led / social accountability processes offer more potential for youth than traditional accountability processes. Discussion: Everyone sat on the strongly agree or agree side of this debate. Look for the PLA Special Edition coming out on paper and on-line in December 2011. In the meantime, check out the current editions here, including PLA 59: Change at Hand – Web 2.0 for Development and PLA 54: Mapping for Change – Practice, Technologies and Communication.